Look at just about any rendering or essayistic sketch of the world’s transportation future, and you’ll notice two things about the cars, trucks, vans, and whatever elses tootling around the roads: They drive themselves and they run on electricity. The funny thing about that pairing is that there’s no inherent relationship between a vehicle’s ability to drive itself and what it uses to move its wheels. Relying on a battery can actually be problematic for vehicles running piles of computers and sensors, but electric rides are a popular choice for autonomy developers anyway, because they feel more like the future. For Swedish trucking startup Einride, though, the connection between electric and autonomous technology is fundamental. Getting rid of the human, founder and CEO Robert Falck says, makes the formidable challenge of running a truck on batteries far easier. Dumping the cab does more than signal that the age of the robo-car is at hand, Falck says. It makes it easier to run the truck on batteries. You save weight. You improve range because you don’t need to worry about a human’s visibility and comfort level, so you can just submit to the laws of aerodynamics. The cab is the most expensive part of the vehicle, and being able to drop it leaves you with money left over for the mass of batteries and the software that makes the whole thing work. All good stuff, Falck says, but the key upside to getting rid of the human is that you can optimize the truck’s use for running on electricity, not for what a human driver needs. Say the vehicle needs to stop once an hour, to charge for 20 minutes. Keep the human in there, and you’re paying them for every minute, even if they’re only driving 75 percent of the total time. It works the other way, too: no more battery-draining stops for quick bathroom breaks. You can plan your routes based on cold logic. “That’s where you really get the business case,” says Falck, who spent much of his career as an engineer with Volvo Trucks. 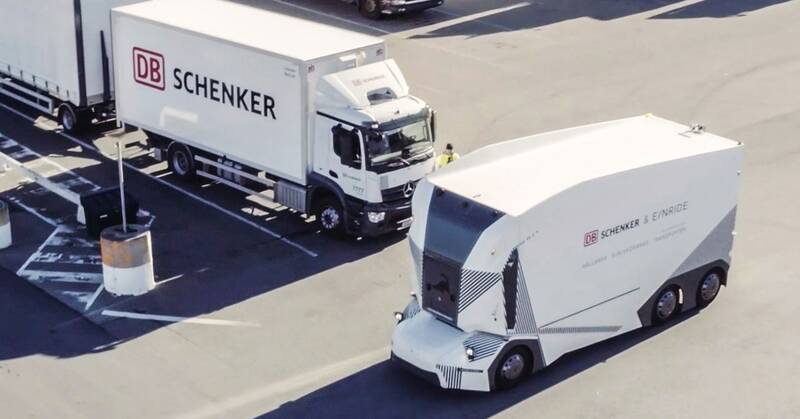 Einride is already moving Schenker’s stuff for a “very cost-competitive” rate, Falck says, and he hopes to get more trucks on the road in Jönköping and elsewhere in the coming months, possibly including the US. The startup has plenty of questions left to answer, chief among them how well its self-driving tech actually works, and how it will handle the logistics and costs of having humans do the remote driving when necessary. But if it can turn up satisfactory answers, it might be able to optimize for the best parts of electric vehicles and the best parts of self-driving vehicles—without any pesky human-based design to get in the way.